Join us at the Spring 2019 New Global Student Orientation! This required orientation is especially designed for new Global Students, which includes international students, MKs and TCKs. View the schedule. This orientation is free, but you must register for it by August 19, 2019. Note for Torrey students: The Torrey orientation schedule may conflict with the Global Student Orientation schedule. However, you are welcome to join us at any time! If you need to be picked up from the airport, please schedule your flight to arrive within that time frame. Biola has a free shuttle that will take you to movies, shopping and restaurants off-campus. Join us to experience this route for your future reference. Also, if you need to buy supplies for your dorm room, we will be stopping at a great store called Target. Bring your money and your shopping list! Join us for a hot breakfast in the Café Banquet Room. This will be our "home base" for the rest of the week. Our Global Student Staff team will lead us in this welcome time. F-1 visa students: This is an extremely important Immigration Seminar for students holding an F-1 Visa. In this session, you will learn everything you need to with regards to traveling on this visa, working while on this visa, and the "Do's" and Don'ts." U.S. passport holders: This session is for U.S. Global students that will get you prepared for the transitions that you will need to go through and will give you helpful tools as to how you should navigate it. Enjoy lunch in the dining hall with your new global friends! Learn about how to stay safe and make wise choices. We will go over some procedures that may be different from the ones that you grew up with. Or go on a campus tour, take a nap, play some soccer or read a book. It's FREE time! Join us for a hot breakfast in the Café Banquet Room. During this super important session, we will learn more about ways to navigate cultural transitions. 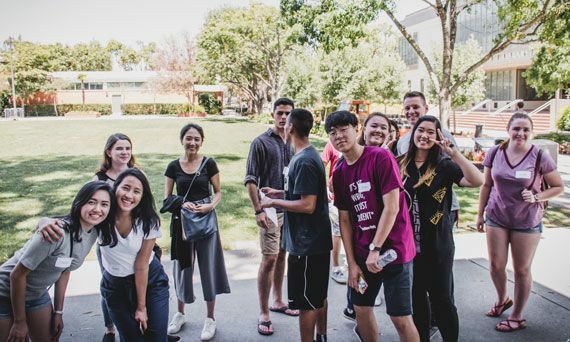 After the New Global Student Orientation, you will join all undergraduate students in Biola's New Student Orientation to learn about how to get involved with the various programs, events and opportunities in the Biola community. View the schedule.